Phelinger Tool & Die is a specialty die shop with emphasis on custom press mounted tooling for the metal fabrication industry. At Phelinger Tool & Die, self-contained dies are manufactured to your specific job application for single or multiple functions. Solutions for hole punching, part shearing, notching and part forming are available. Examples of parts produced with Phelinger tooling are shown in the Parts Gallery page. Dies are manufactured for processing flat parts, structural parts such as angles or channels, brake or roll formed parts, aluminum extrusions, tube and pipe and non-alloy materials. 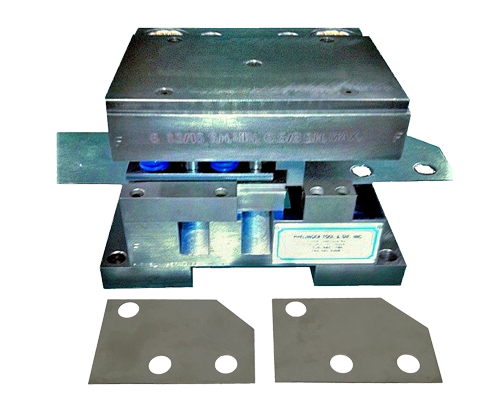 Phelinger Tool & Die also offers a repair and rebuilding service for your existing dies. We will evaluate and promptly quote a cost to repair, avoiding costly production downtime. Please use the form below to contact us or give us a call at 716-685-1780. We would like the opportunity to discuss your tooling requirements and provide a cost effective solution for your next job.